Maybe it's skepticism. Maybe it's Kickstarter malaise. Maybe people just don't care. 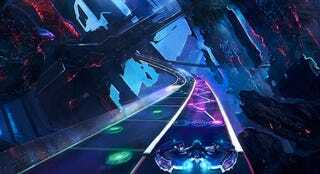 Whatever the reason, Harmonix's Kickstarter for Amplitude, an attempt at reviving the niche PlayStation 2 game of the same name, is not doing very well. As of this writing, it's sitting at around $643,000 of its $775,000 goal, with just about two days to go. Over the past few days, the Kickstarter has seen a surge in interest and backing from high-profile figures. Minecraft creator Markus Persson and actress Felicia Day asked their millions of Twitter followers to go back Amplitude, and the studio Insomniac Games gave $7,500 to the project yesterday. But time's running out, and they're still over $100,000 short. "We're way more optimistic now than we were last week, but we're still incredibly nervous," Harmonix's John Drake told me in an e-mail this morning. "This has been a passion project at Harmonix for a long time and we're just within reach of making a game that publishers told us wouldn't be possible.